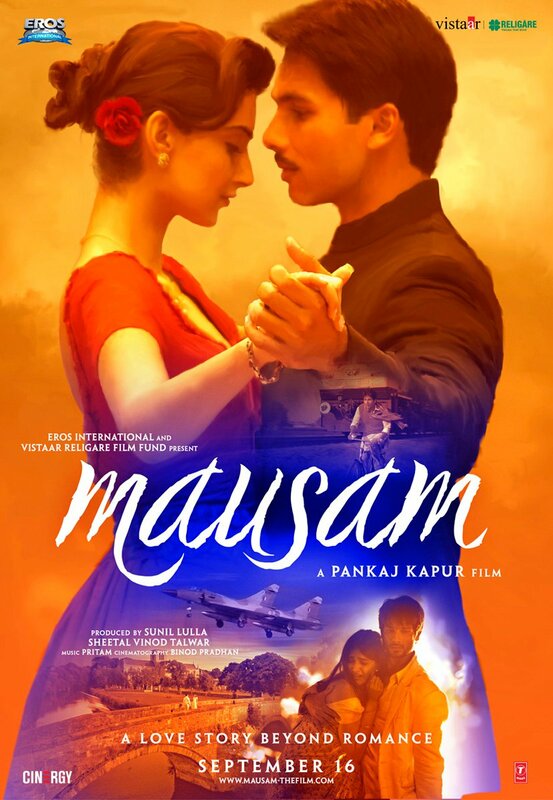 Pankaj Kapur’s magnum opus love story Mausam, starring his son Shahid Kapoor and Sonam Kapoor in lead roles looks to bring back star crossed lovers attracting and repelling, changing and growing as the seasons go along. 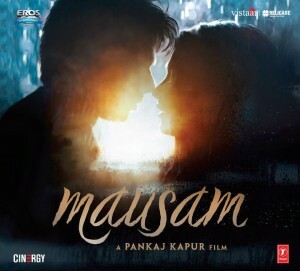 From what we have seen Mausam has shaped up really well with the exciting and passionate promos. Expectations are mammoth with this being Shahid’s only film of the year, and Sonam’s possible game changer role, fans cannot wait until the film hits theaters on September 16th. From the first two promos the music is also something fans have been eagerly awaiting to get their hands on. Will this be a return to top form for music director Pritam? Let’s see how his compostions turned out. From the opening strums of the acoustic guitar, Rabba Mein Toh Mar Gaya Oye, is immediately inviting and sweet on the ears. Shahid Malliya is a singer to watch for, his voice is gorgeous on this track both conveying the lovesick and sadness. The song brings to mind ‘Ajj Din Chadeya” from Love Aaj Kal, which is a worthy comparison in showing the great music Pritam is capable of. The very rustic dholak beat that mixes with the very modern sounds of the guitar works very well for the song and makes the track lovely even when Malliya is not singing. The second version for all Rahat Fateh Ali Khan does make it sound very much like ‘Ajj Din Chadeya’ even more, but Khan brings something different to each track he is given. This retread is no different and he sounds very comfortable on the track, but Malliya’s version is the tops. The rollicking Punjabi track, Saj Dhaj Ke, opens with women singing a traditional sangeet verse, and when Mika enters, you can just feel your shoulders rise to join in the fun occasion. The composition of the tune is great, the dhol and whooping in the back make it a very informal and fun Bhangra track. Mika Singh has become synonymous with any Bhangra/Punjabi track and with each new song he is given, he makes a great success, and this one is no different. The lyrics are quite hilarious in parts and add to the Punjabi wedding picturizaton. The track comes with two remixes, the first Desi Mix Tiger Style, which is grabs the listener in with the sangeet verse, and actually living up to its ‘Desi’ name with adding more tumbhi and dhol beats which sets it apart from the usual remixes. The next, Club Mix Tiger Style, is the more typical remix number and does not add much to the song as it sounds very routine, skip this one. Ustad Sultan Khan opens the song, Ik Tu Hi Tu Hi, and then Hans Raj Hans takes over and turns the song into such a haunting affair. Hans Raj Hans is so underused in Bollywood songs, so it is always nice to hear him grace a tune and this is one song to savour. His voice and the male chorus complements the fabulous arrangement and mixing very well making this song a winner. The song tells of separation and despair, but unlike other songs jammed into the film, ‘Ik Tu Hi Tu Hi’ is a cut above the rest, the lyrics are so evocative and it makes this track a favourite. If the first version was hit, then we get 2 more versions, which are wonderful as well. The Reprise track with Shahid Malliya taking over is an interesting because Malliya’s voice really evokes the sadness and loss of the lyrics. The next is the Mehfil Mix, which opens with some upbeat chords and the Wadali Brothers guest on this version, and it brings the track to another level of brilliance. The brothers take turns with the main verses which is excellent in noting the contrast in their voices, but when they come together for the chorus it becomes lovely. Ustad Rashid Khan who created the haunting ‘Aaoge Jab Tum’ from the Jab We Met soundtrack sings Poore Se Zara Kam Hai. The lyrics are utterly beautiful and though they sound like they belong in a Rajesh Khanna film, the simplicity of the lyrics for this film conveys so much. Even though it is a situational track, it works perfectly as a stand alone song. The composition Poore Se Zara Kam Hai, with the strums on the guitar and flute lilting in the background make this a poignant track. ‘Poore Se Zara Kam Hai’ definitely belongs to the same league as some of Pritam’s best songs. Aag Lage Us Aag Ko starts powerfully with another underutilized singer Karsan Sagathia leading the track. The song has a Gujarati feel much like ‘Dholi Taaro Dhol Baje’, which Sagathia sang and the composition is fabulous with the thumping dhol and chorus in the back. Since it is rather short, perhaps ‘Aag Lage Us Aag Ko’ is being used for an important part of the film, it seems perfect as dramatic and strong situational song. The one club number Mallo Malli surprises one by not being one of those oft-repeated Pritam compositions we hear so often. The lyrics have a Punjabi style and getting Tochi Raina to render them instead of a Neeraj Sridar works so well on this track. Tochi Raina shines despite the autotune and Hard Kaur’s backing vocals are not too distracting and both singers make this track unusual and fun. The composition is engaging with the mix of drums and electronica, and when the tempo speeds up around the chorus, you can’t help but dance along. The alternate version Mallo Malli II features Lehmber Hussainpuri and Hard Kaur and it works equally well with Hussainpuri’s voice, which is not altered by the autotune and it strengthens the track from the original at times. Now it comes as a bit of a surprise when the remix version of the song is actually fabulous with it’s hook heavy beats and good integration of Raina’s voice instead of drowning the singer’s voice out like most Pritam remixes. Definitely, check out each version and take your pick! The soundtrack to Mausam is one of the best Pritam soundtracks in a long while and hits back at all his detractors by showing what he is capable of. The soundtrack mixes both music the masses will love and music connoisseurs too; in short, it is a glorious return for Pritam! There is no real sore track in this album as the situational tracks are equally created with care, there is something for everyone to love on this album. An absolute must listen.